Our first writing workshop took place in Cap Haitien on the breezy veranda of Brise de Mer, overlooking the bay beside the Medical Ambassadours of Haiti (AMDH) headquarters. How would it be received? It’s one thing to deliver writing workshops in my own language and in my own country, but to come to an unfamiliar place and, through a translator, show people how to write their stories was a challenge I wasn’t sure I was able or qualified to meet. Home seemed a long way away. I didn’t know it at the time, but my partners-in-this-crazy-idea, Rhonda and Liz, were even more nervous than I was. The first participants were a group of experienced trainers with AMDH’s CHE model (Community Health Evangelism) – men and women who possessed a tremendous heart for their communities and volunteered many hours to helping develop projects and programs to improve the standard of living in their villages. 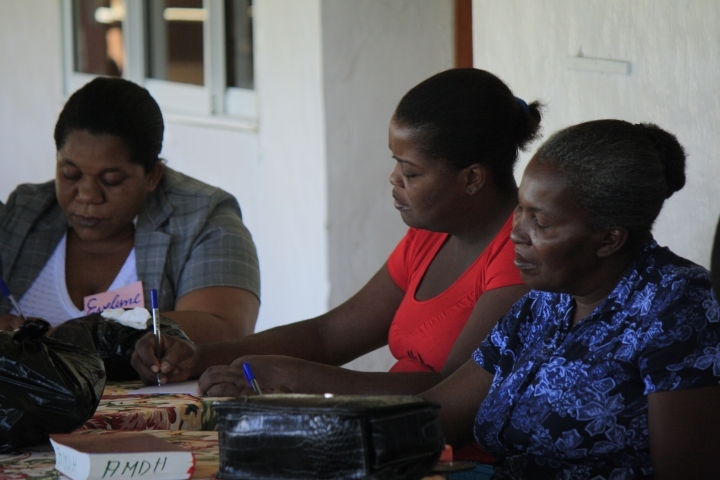 These men and women were responsible for inspiring remarkable changes in a very short period of time in rural Haiti. The CHE model is one of community development. The group has enjoyed huge successes in northern Haiti and is poised to move into southern Haiti soon. Now with over 1000 Haitian volunteers in 30 programs, AMDH is being approached by several non-government organizations (NGOs) interested in partnering. The CHE program will only enter a community if the members vote to invite it. Each community has its own committee and AMDH helps them develop sustainable projects such as those Mme Philisma mentioned. With the exception of the school, most are easy projects that are inexpensive to implement. Once communities begin seeing the result of these small changes, they become fully involved, excited, engaged and eager for more. Following the earthquake, NGOs became more cautious with their spending and now will only consider supporting communities that are organized and cohesive. CHE creates such communities. I will have a chance to see some of these villages first hand when we leave for Mombin Crochu tomorrow. But for today, I still had my inaugural workshop to get through. 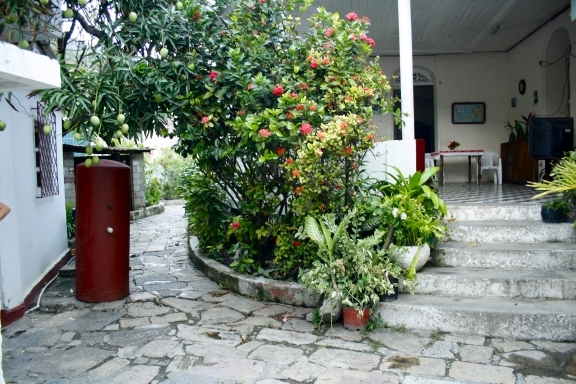 The AMDH headquarters is beside Brise de Mer, in a small oasis at the end of the waterfront promenade. 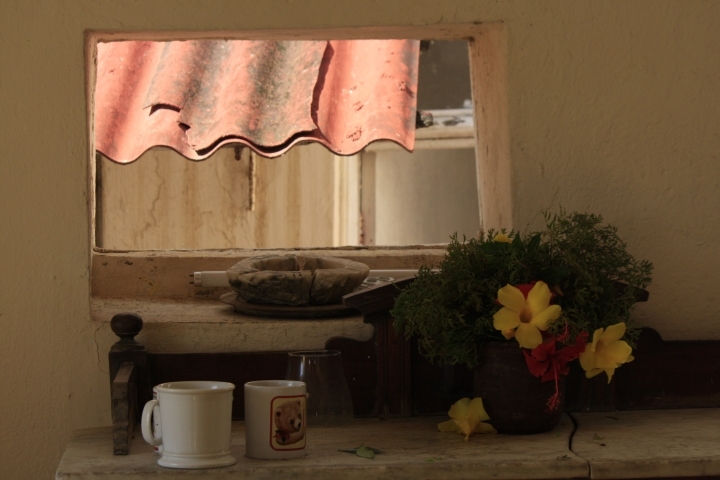 Renting the veranda was a blessing as it wasn’t planned or budgeted, but I was elated for my own peace of mind, if nothing else. I had not yet adjusted to the heat and didn’t think I could stand a hot, confined room. I needed to be on my game and responsive to these first participants. I also wanted them to have a good experience and wanted them to have space to spread out. The veranda was perfect. The response of this group would be crucial to the ones that followed. Ossé St. Juste, the Director of AMDH (a quiet, unassuming man with a very clear vision for Haiti) was also in attendance to assess the quality of the training. No pressure there. Throughout the day, Rhonda observed and frantically scribbled notes, while Liz worked hard translating from English to Kreyole and Kreyole into English. Liz is an amazing and energetic translator – plus she knows the culture well, so was able to give me advice when needed. The day went beyond our expectations. At the end, I asked everyone present if they would provide me with their honest opinion, nothing held back. I needed to know what worked for them and what didn’t. If I wasn’t clear or if changes were required, I needed to make them before we headed into the mountains the next day. We were elated. This affirmed that this wild idea was a solid one. What more could we ask for? 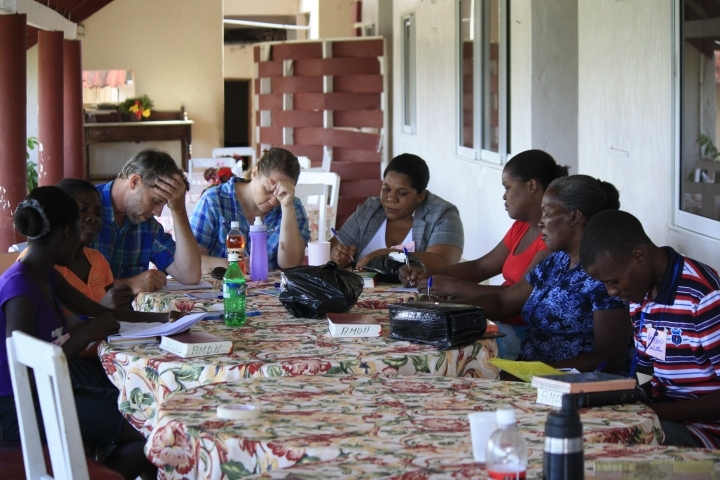 And so went Day Two in Haiti and workshop #1….eight more workshops to go. On Saturday we would be up at 4AM for a grueling four day trip into the mountains. Little did we know the adventures that lay ahead. gled to hear your first workshop went so well ! What I liked best was the comment that those people won’t to inspire others to write their stories I am curious to find out the rest of your time there ? I am so excited to read about your first workshop! You are doing just what you are supposed to be doing, and have been gifted to do — help people tell their stories. I am full of joy as I read of your adventure! Deb, I am so pleased for you. Obviously you have made a real connection — and such an important one for those in Haiti — bless your heart as you move through this amazing adventure. You are there because they need you to be there.